Well, to be honest this challenge has not gone as I had hoped or expected. I haven’t given up and I’m continuing to give myself grace as the days pass. I had not had a migraine in months and then over the weekend, I had a 2 day migraine that left me swooning with a sore brain on the 3rd day. The day following that, I got out a yoga DVD and half way through had a sharp pain shoot through my leg into my groin so I stopped; then I did some simple yoga stretches about 1/2 hour later and did ok. Then yesterday, I put off yoga until lunchtime and wouldn’t you know it? Vertigo kicked in. I couldn’t move without the room spinning!!!! Geez! If you don”t know me, you’ll either think I’m in horrible health or that I’m making this stuff up!!! On another note, in case you’re wondering, I’m continuing with my sugar free lifestyle. I can’t believe it myself. I’m 4 days shy of being a whole 3 months without sugar! I’m noticing lately that I’m craving sweets less and less. I still want something sweet on occasion, but it’s not every day or every meal or every snack like I did 3 months ago. It’s been an interesting journey. I think this journey is helping to ground me in the struggles I’m coping with trying to do yoga every day. Haven’t weighed myself in a while so no weight loss to report. I did measure my waist and I’ve lost 2 inches since the last time I measured. That’s pretty cool. The jeans I bought in June are getting baggy so that’s cool too. They’re not baggy enough to need to buy new ones. I’m just washing them more often and putting them in the dryer! I’m knitting the coolest hat! I’m making mine in a pretty green color. The cables are challenging for me and I’m not sure why. Perhaps because the only needles I could find were metal so the yarn wants to slip off easily? I’m about halfway to shaping the crown! It’s a KAL (knit along) with some women in my knitting group. Two have almost finished (working on the crown) and one is behind me. We’re not doing very well with knitting at the same pace. I think I’m on pace, the other two are over-achievers and the one behind me is the owner of the shop and has too many interruptions to knit for any length of time! 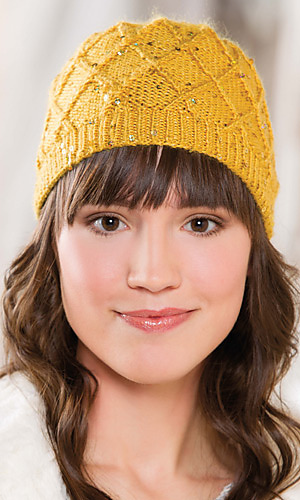 The pattern is in the latest edition of Creative Knitting magazine. I’m also working on my bed quilt. I really need to upload those photos!!! Posted in Uncategorized and tagged 100 day challenge, hat, knitting, quilt, yoga. Bookmark the permalink.